Do You Know What You Need to Know About Mammograms? Having fun at Jenny’s Full Service Salon in Mechanicsburg. 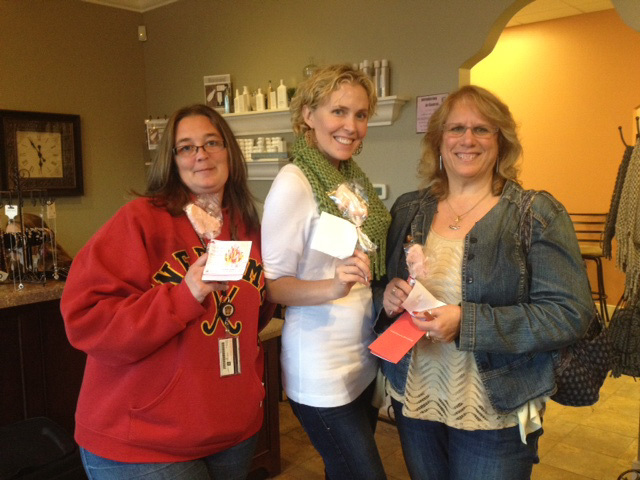 We had a great time last weekend during our events at Momentum Fitness in Mechanicsburg, PA, TR Fitness in Toms River, NJ, the Center for Health and Healing in Toms River, NJ, and Jenny’s Full Service Salon in Mechanicsburg, PA.
We met a lot of women who had some good questions about mammograms. A few were surprised by our answers. For instance, did you know that you don’t need a prescription from your doctor to get a screening mammogram? You can get a mammogram when you need it, and you can choose your own provider. You don’t have to coordinate your mammogram with your annual physical, but some women prefer to have the appointments around the same time to make it easier to remember. Some want to have their mammogram first so they can talk about it with their doctor. We make it easier to do that by providing your results within one business day. When you come to ella health for your mammogram, we’ll make sure your doctor gets your results so you don’t have to worry about it. Another thing you won’t have to worry about is getting your previous images if you’ve had a mammogram somewhere else. We’ll take care of that for you. And did you know that you may be able to get a screening mammogram as early as age 35? Although you don’t need to start annual mammograms until age 40, some insurance carriers will cover an earlier exam to give you a baseline. These images will be used to monitor changes in your breasts over time. The women we met seemed most surprised to hear that we’re not a typical health care provider. When you come to ella, you’ll feel more like you are coming to a spa than a clinic. We have comfortable waiting rooms, private dressing rooms and warm robes. We play relaxing music and provide coffee and tea. We’re friendly and we’ll answer all of your questions.